Search Engine Guide > Mike Moran > How do you give Google what it wants? No matter who you are, at some point it is natural to throw your arms up in frustration and ask, "What does Google want from me?" For most of us, no matter how much we know about SEO and no matter what we do, we eventually feel like we've hit a wall. We just can't seem to (pick one) raise our ranking for that keyword, get more search traffic, sell more to searchers, or fill in the blank here. And it is natural to start thinking about how that Google ranking algorithm does its magic. It's human nature to ask yourself, what do I need to do to please this fickle machine? 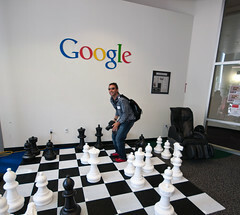 At Google headquarters, what are those geniuses looking for? If you didn't read the excellent article recently in this space by Stoney deGeyter on the difference between chasing SEO algorithms or analytics, go do it now. (I'll wait right here.) Stoney's advice is excellent--chasing the analytics will serve you better than chasing the algorithm. But why is that true? I mean, if you could figure out the algorithm, couldn't you set up your site to appeal to it and be done with it? Well, easier said than done. There are hundreds of factors in the algorithm. The algorithm changes all the time. And, Google has begun personalizing search results so that every searcher is using a somewhat unique algorithm. The basic idea, according to Ted and his forum participants, is that Google is constantly grouping searchers based on what they do, grouping search keywords based on what their supposed intent is, and grouping Web sites based on how they fit with the other two. So, if they believe that a searcher is looking for information (based on what he ahs done before and the keyword they are using now), Google will show more informational Web sites (rather than product catalogs, for example) at the top of the list. The result of all these machinations is that Google is deciding how much traffic comes to your site and what kind of searchers comprise that traffic. If you are a Google-hater, you can develop all sorts of conspiracy theories about this, but my suspicion is that Google is merely trying to give people better search results so they will stick with Google rather than another search engine (Bing) or a completely different way of getting their answer (Facebook, Yahoo! Answers, or dozens of others). So, it probably already sounds a bit daunting to figure out, but it gets even more arcane. These various groupings we defined above are ever-changing, so as you change your site and searchers change their behavior and their keywords, you might meet new people. And, just in case that wasn't complicated enough for you, Google keeps testing exactly how the algorithms should work, so nothing is ever stable for very long. So, how do you give Google what it wants? You need to know exactly what your Web site is for and work that purpose to death. If you find that you are attracting all the wrong kinds of searchers, you can wait a few weeks and see if Google figures out who it should be sending to you, but at a certain point, you might need to accept the fact that the clues your Web site is giving Google don't match the searchers you need. At that point, it would make sense for you to refocus your Web site on its exact purpose rather than trying to be all things to all people. Specializing has always been a key to search marketing success, but now more so than ever. Instead of focusing on what the algorithm is doing, instead focus on who your customers are, what their problems are, and how you solve them better than anyone else. And then let Google figure out which searchers to send you. Search results drop? Blame it on Panda. The most uniquely relevant results for the searcher. Now that you know what Google wants, does that change anything? Excellent post. I'm definitely of the opinion that Google is some strange gatekeeper we're constantly trying to please to get past. That being said, I love the complexity of Google in every way. I appreciate your thoughts and will definitely work towards the idea of refocus. I think that depends on what you've been doing up until now, Steve. For some people, it changes nothing. But I think the "SEO is dead" crowd is worried right now because of what they think SEO is.